Maybe I was a little late getting into Slough Feg compared to other people, and that may well be the reason I highly value their latter albums, as I simply never got around to hearing the older ones. Yet I still found it hard to accept some “from the cradle” fans’ arguments that Atavism was a weaker Slough Feg album. Their standards may have been set in the past, and I don’t buy for a second that shorter means not as good. Even at 38 min Atavism had more original and quirky ideas than some run-of-the-mill polished Euro power metal band. Listening to Hiberno-Latin Invasion (who would even think about naming the song like that) or title track or Eumaeus the Swineherd/Curse of Athena dilogy still gives me shivers now, just like it did two years ago. It is a testament to the acumen and the survival skills of Mike Scalzi that he has been able to recuperate after losing half of the Slough Feg team from the previous album (save bass guitarist Adrian Maestas). Despite all the difficulties the Slough Feg express moves on, although it seems that the timeline of the band’s music moved even further back into the 70s, so do not expect the return of folk metal (after all this is not Lord Weird Slough Feg anymore). 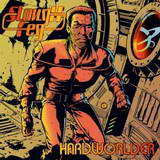 If you want to write a guitar driven album you need the riffs and Slough Feg certainly knows how to craft those. This may be the most evident with opening and closing instrumentals, the proverbial winding and unwinding of the screw. The Return of Dr. Universe and Whirling Vortex, respectively, are classic Slough Feg making a play on a single riff and living off its variation. Individual album tracks are also flexing their muscles in the riffery department, be it the flagship Tiger!Tiger! (Alfred Bester inspired?) or the title track, where the band latches onto the main riff so bad, it is not only driven in and through your skull, but the following pair, The Spoils and Frankfurt-Hahn Airport Blues, are conjoined with it as well. Guitars rule the roost on Hardworlder at all speeds and tempos, on a faster, noodly and super-catchy Poisoned Treasures, practically doomy with a shining bass line Karma-Kazee or acoustic darker full of pirate romanticism The Sea Wolf. If you dig a little deeper and try to get underneath, there is a ton of free-lancing going on, a la early 70s Deep Purple (Frankfurt-Hahn Airport Blues) and just about every track has an excellent solo or melody associated with it, the main examples being the half song outro of Tiger!Tiger! or the dual harmony in the middle of the title track. Galactic Nomad harkens back to the Traveller days, with its spacey gliding guitars reminding of Jon Lord keyboards on Fireball. Mike’s vocals are their rough clean self, easy to understand, very rock band frontman-like, but never too polished to lose credibility. These days Slough Feg sounds a lot more like Thin Lizzy and early Deep Purple (minus keys and Blackmore wizardry), than they do like Skyclad or formers selves. Dearg Doom cover of the Irish rock band Horslips, nevertheless, fits, and if not given credit Slough Feg could have fooled us that it was their own creation. Another cover on the album is Street Jammer by Manilla Road, the band from the same stable as Slough Feg, but no comment from me as I am not familiar with the original (it does sound like Highway Star with underdeveloped chorus). If anything, Hardworlder sounds a little more weighty than Atavism, which does not make it very easy to accept as a whole album originally. Individual tracks resonate well, but you can’t effortlessly glide through the whole album. The feeling fortunately easily passes, but I still missed some of the earlier quirkiness. Bold as they are, the band is a proud part of “Try Before You Buy” campaign on Cruz Del Sur, just visit the label’s website.